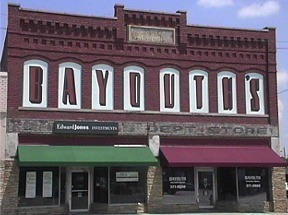 We Can Take Care Of You!!! 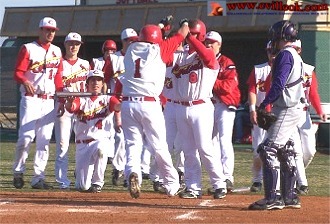 Larry Howard (#1) cleared the fence with this swing for a solo homer in the 3rd inning to put the Cards up 4-0. 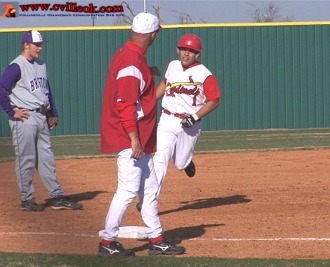 He was greeted below by Coach Reeder at third, and his teammates at home plate. 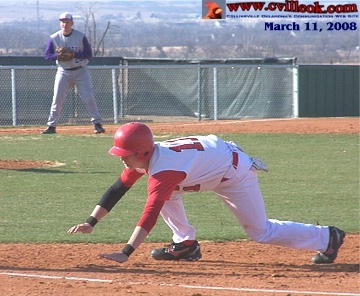 Trevor Rabbitt (#11 above) scrambled back to 1st base to avoid a pickoff throw in the 2nd inning. A Riley Murr double moved him to third and they both scored on the Kyle Keith swing (below) for a 2-0 lead over Bristow after two innings. 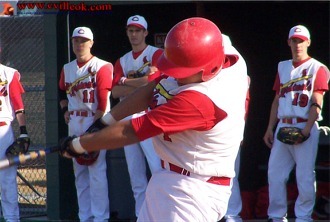 Randy Rogers (#16) pitched a 1-hitter for the Cardinals who scored 9 runs in 5 innings on 10 Cardinal hits. 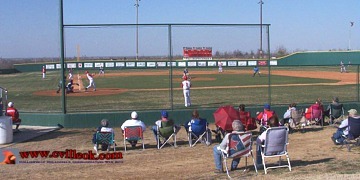 Garrett Tole (#12) got a 3rd inning single in this photo. Tole also had a 3-run triple in the 4th inning. 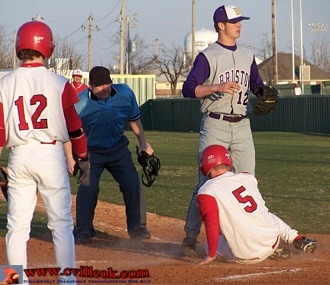 Brad George (#2) rounds 2nd base heading to 3rd on a Lane Coulter double in the 4th inning. He scored the Card's 5th run on a passed ball. 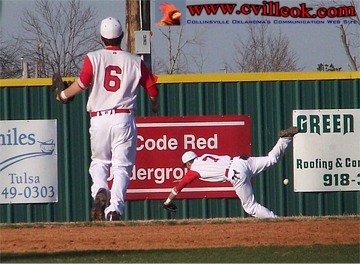 Garrett Thurman (#7) made a diving attempt in center field but couldn't get this ball from Bristow's leadoff batter in the 5th inning. A good throw to 3rd base eliminated that baserunner. 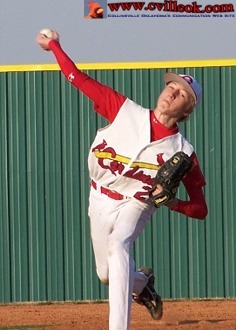 Randy Rogers (#16) pitched the Varsity to victory Tuesday. 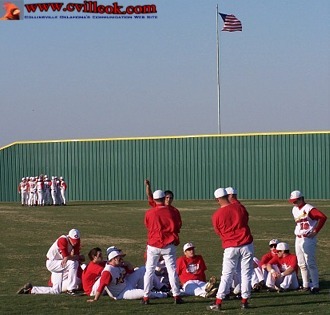 The Collinsville baseball varsity discussed their win over Bristow while the JV prepared for the 2nd game against Bristow (in the background). 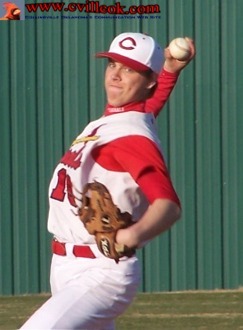 Channing Newland (#20) was on the mound for the Cardinal JV. 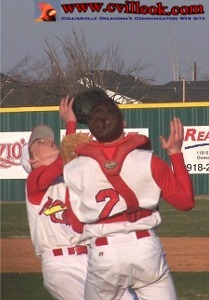 Pitcher Channing Newland and catcher Jayce Crowder (#2) had their choice on taking this popup early in the JV game. 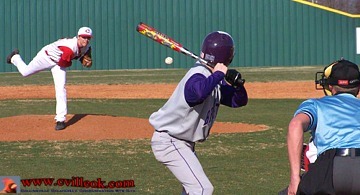 Trent Lee (#12) sent this second pitch over the fence for a leadoff solo homerun in the JV game against Bristow. 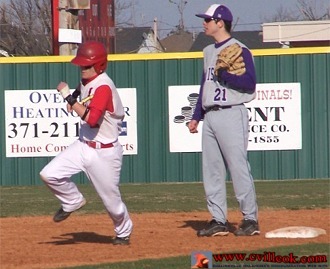 Cody Crown (#5) scored on a passed ball in the 2nd inning of the JV game.